Despite some rather unsettled weather conditions and some midge infestations, work has progressed well at the High Pasture Cave site. A good core of volunteers, most of which were enthusiastic in the face of such hardships, have helped the Project Team in driving home our aims and objectives for the 2008 season. With just two weeks of fieldwork remaining at the site this year, the following overview provides an update on recent developments. Work in Trench 19 has continued to reveal features that pre-date the formation of the burnt mound in this area of the site. Below the burnt mound deposits we have uncovered features including small post-holes, a possible post-pad, a stone setting containing a heat-fractured saddle quern stone and two walls of varying construction. The image above shows Bryonie Mahe and Anna MacQuarrie excavating in Trench 19, with Kenny Brouwers and Michiel Peterson carrying out survey work in Trench 20 beyond. 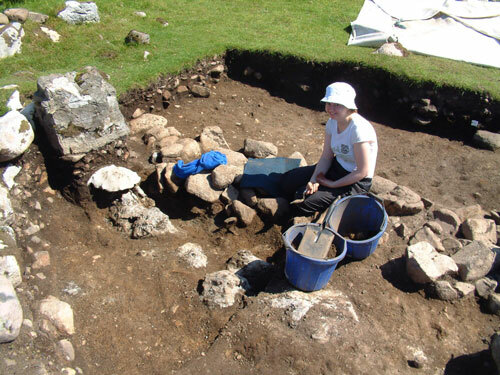 The image below shows Bryonie Mahe excavating the wall - feature F19.04. in this sector of the trench, the function of which we cannot be sure at the moment without further investigations. Anna MacQuarrie and Lorenzo Lane excavating in Trench 19. Below the burnt mound, a grey layer was encountered (of varying thickness) that may be some form of burnt residue. The layer is fairly continuous over the surface of Trench 19, contains charcoal and bone fragments, and is also contemporary with most of the features so far encountered below the burnt mound deposits. Small finds have been few from this horizon, although we have recovered several coarse stone tools, a fragment of stone crucible, a flint flake and a sherd of possible All Over Cord Beaker. 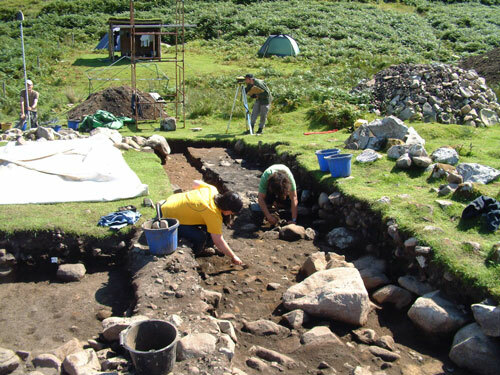 The image above shows Kath Small and Bryonie Mahe excavating the last of the burnt stone deposits immediately above the grey layer. A small stone setting was uncovered embeddied into the grey deposit, over which had been placed a burnt saddle quern stone. The quern had been placed in an upside down position on the stone setting (see an image of the quern in the latest update on the Finds Page). The image above shows the stone setting after removal of the quern, which came away in several fragments due to the intense heat the object had been subjected to (scale = 0.5m), and the impression of the quern can still be seen in the underlying sediments. The feature was section excavated, but this failed to reveal any other deposits associated with the quern. 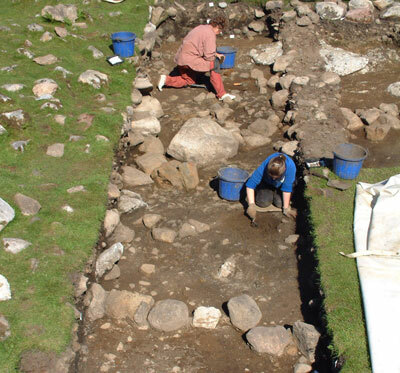 The image below shows Jo Morris and Bryonie Mahe excavating in Trench 19, with Anna MacQuarrie planning one of the walls uncovered in the trench. 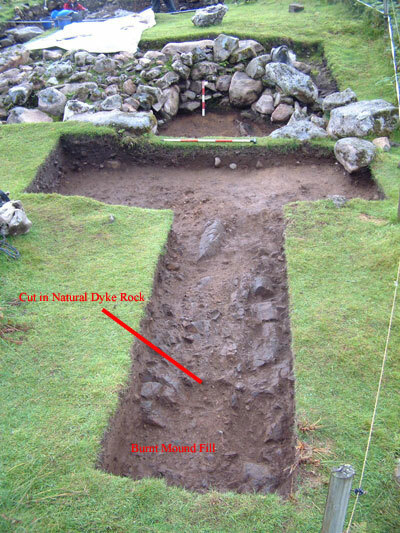 The image above shows the main wall feature F19.04 (scale = 1m), which gently curves and utilises the large granite boulder visible in the image. To the right (NW) of the wall, the natural limestone bedrock has been encountered. 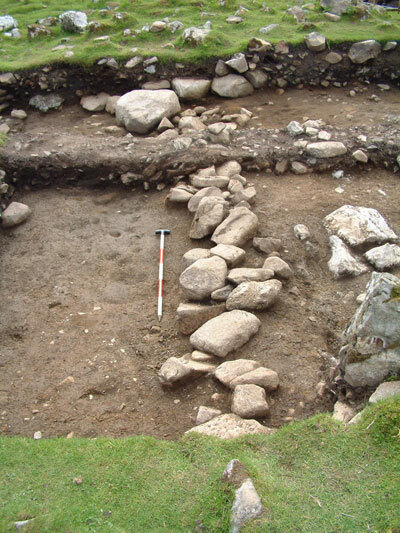 The feature may be some form of wall division, or revetment wall; or does it belong to an earlier building at the site? 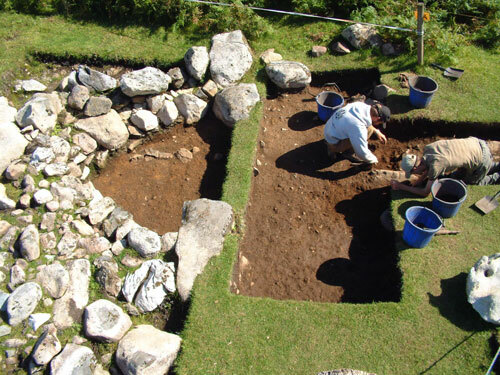 The feature may have formed a base for a turf wall, although this requires further excavation in this area of the site in 2009. The image above shows a general view of the features exposed in Trench 19 from the east (scales = 2m & 1m). The larger, more substantial wall, can be seen at the tope of the picture; while a second single boulder wall can be seen nearer to the camera. 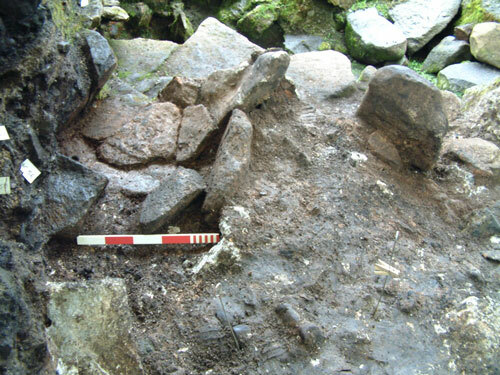 The stone setting that was overlain by the up-turned and burnt saddle quern can be seen between the two walls, while other features have been idnetified nearer to the camera position. The image below contains labels for these features, including two possible post-holes that are located in the southern baulk of the trench. 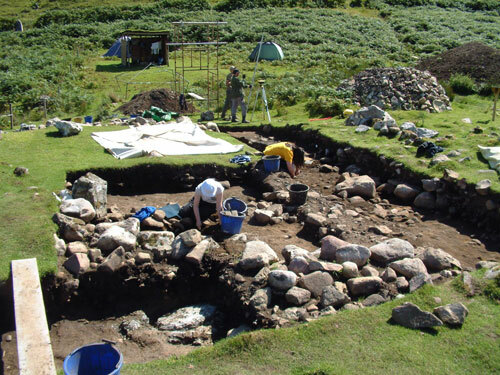 Further extensions are planned to Trench 19 for the remainder of 2008 and in 2009, to investigate the activities that were taking place in this part of the site. The excavations and recording in Trench 15 continue to be complex, with a number of features revealed over the past month adding to those uncovered in this area of the site during the past two years of fieldwork. 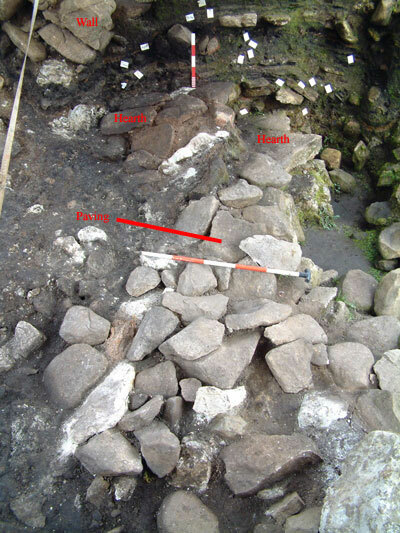 The image below shows a boulder revetment wall and possible hearth or pit feature, the latter containing orange ash deposits and lumps of charcoal (scale = 0.5m). The wall here demarcates the area nearest to the cave entrance that contains the multiple hearth settings and ash deposits (to the left in the image) and the in-filled natural hollow that once contained the active stream that fed the cave entrance (to the right). A fine granite saddle quern stone was recovered from the chaotic rubble fill below this wall, which had been placed upside down. Formed on a large granite pebble from the nearby beach of Camas Malag, the quern was complete. 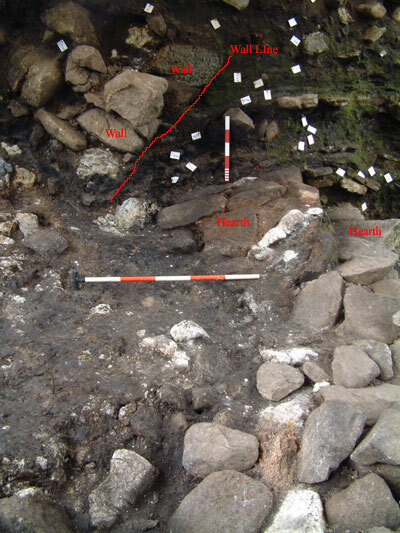 The hearth or pit feature highlighted in the image above was section excavated and was found to comprise a roughly circular deposit of orange ash, contained within a circular deposit of charcoal-rich ash (see image below - scales = 0.5m & 0.1m). The ash overlay a deposit of fire-cracked stone and pebbles, but contained no small finds. 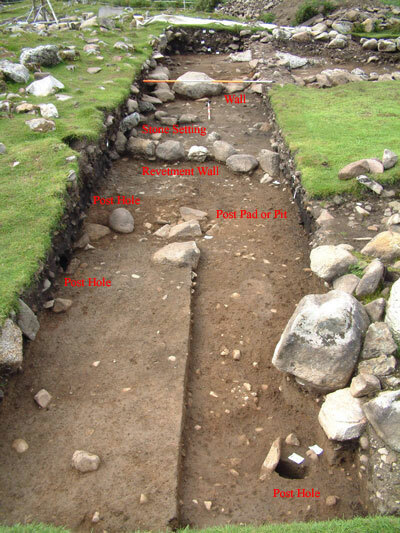 To the north and adjacent to the boundary with Trench 2 (excavated in 2005), a narrow layer of paving was uncovered leading towards one of the larger granite-slabbed hearths (see image below) that would have been located just outside the cave entrance leading into Bone Passage (scale = 1m). 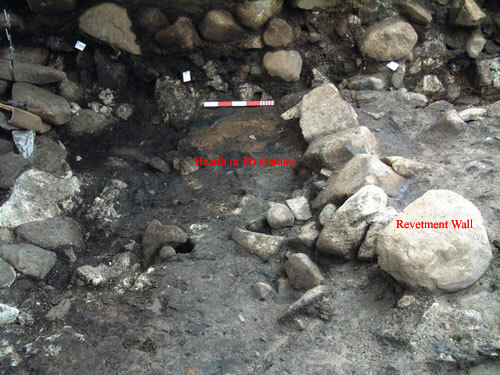 The image highlights the position of the paving, two of the super-imposed hearth settings, and the remainder of the large revetment wall that demarcated this area of the site (seen leaning in section to the left of the hearths in this image). 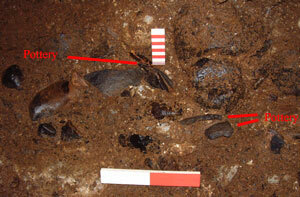 The image below shows these features in more detail, after the removal of some of the adjacent paving. Significant quantities of animal bone, some of this well-preserved, has been recovered from around the hearths; and while some of this material is burnt, most of the material shows no indication of contact with the fire. Along with the animal bone, several bone pins, antler tine points and a soapstone spindle whorl have been recovered from this area (see Latest Finds Page). Much of the animal bone comprises pig, although cattle, sheep/goat, and red deer bone is present. Small quantities of shellfish have also been recovered here including limpets and periwinkles. To the south of the paving and hearth settings, a fairly level area has been formed and cobbled with fragmented limestone - possibly from the adjacent limestone bedrock that appears to have been modified. 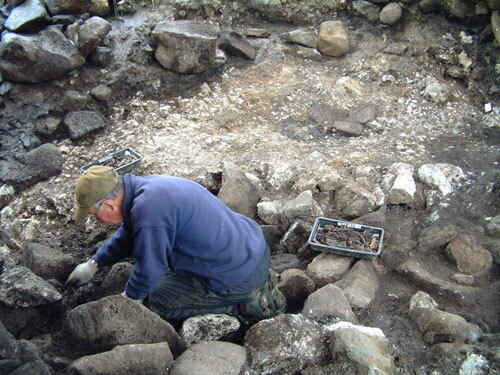 The image above shows Martin excavating to the north-east of the cobbled area, from which he recovered fragmented animal bone. Set within the surface of the cobbling is a small set of granite slabs, a possible hearth, with associated charcoal and ash deposits. Around the hearth, Martin recovered two finely polished bone points, or awls, manufactured on fractured animal bone (see Latest Finds Page). 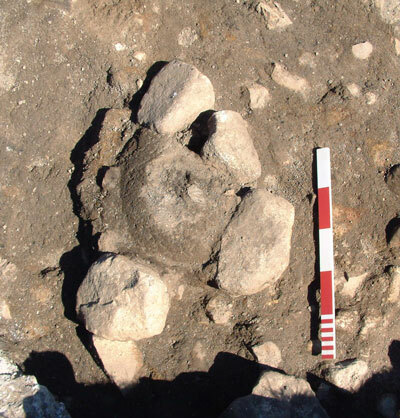 Excavations around the main hearths in Trench 15 has revealed a succession of these features, one lying almost directly on top of the one below, formed from granite slabs. The hearths show evidince of intense heat and are surrounded by ash deposits containing animal bone and shellfish remains. 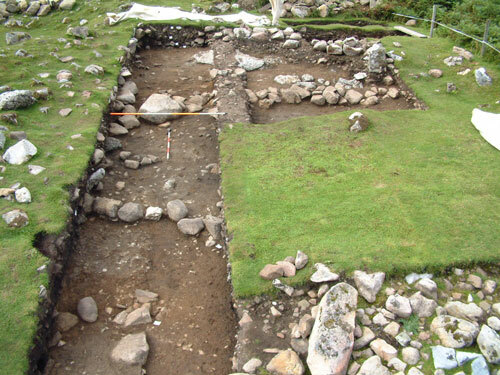 Upright slabs define some of the hearth settings and associated activity areas (see image below - scale = 0.5m), which adds to the complexities of excavating these features. 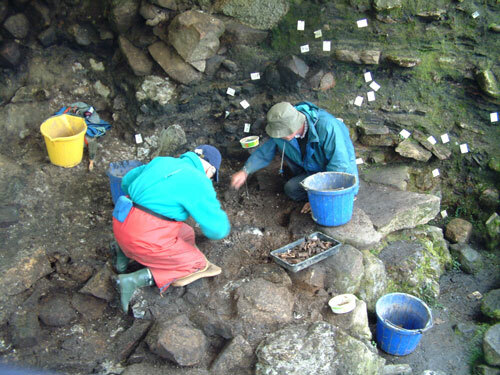 The image above shows Ann Wakelin and Tom Jamieson excavating one of the hearth settings, and collecting trays full of animal bone. It has become quite clear through excavations in this part of the site (and thin-section sediment analysis) that the area around the hearths formed the main focus of the site at the surface and was most likely the location where animal processing, cooking and the heating of stones took place. 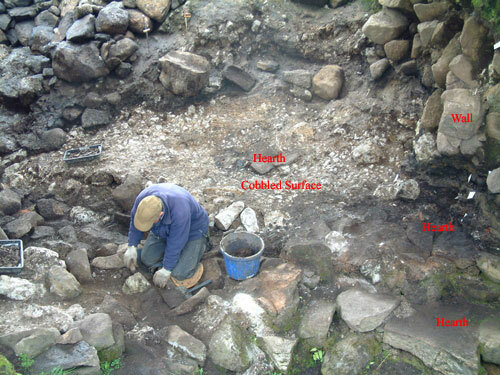 However, it is also clear that the hearths and their associated features also became a focus for ritual deposition. Small finds in this area include cache’s of soapstone spindle whorls, stone tools and a large number of bone and antler items. Excavations in Trench 15 should be completed over the next two weeks, although extensions are planned for the 2009 fieldwork season to investigate the full extent of the features that dominate this part of the site such as the stone revetment walls, hearth settings and potential paved walkways that accessed the cave entrance leading into Bone Passage before the stairwell was constructed. Excavations in Bone Passage are almost at an end, with the removal of the last deposits leading down the ramp into the main stream passage. At the north end of Bone Passage we have uncovered a natural depression or pot-hole within the limestone floor, which contains deep water-washed deposits including gravels and silts. Previous excavations of these deposits elsewhere in Bone Passage has produced few finds, with the exception of small fragments of animal bone, burnt bone and fire-cracked stone. However, within the deposits in the natural hollow, we have recovered some impressive sherds of prehistoric pottery - potentially spanning the Late Bronze Age back to the Neolithic period. The deposition of the pottery within these water-washed sediments most likely relates to some catastrophic flooding event at the High Pastures site, with the re-activation of Bone Passage. Flood waters most likely collected the sediments and associated archaeological materials from around the cave entrance, depositing them at the far end of Bone Passage. It is of course possible that we have lost material relating to this event, which has washed through the cave system to be deposited elsewhere. The image above shows some of the pottery sherds in-situ during excavation, trapped in the sediments between larger granite stone clasts that have been stained black through some form of mineral deposition (which also coats some of the bone and pottery deposits recovered - scales = 0.2m & 0.1m). Some of the pottery sherds are fresh and show little sign of abrasion, suggesting that they were buried quickly and were not subjected to further disturbance after burial. The pottery, which includes some large refitting pieces, also includes some decorated sherds that resemble Hebridean Neolithic Ware, similar to the material recovered from the site of Allt Chrisal in Barra, in the Western Isles of Scotland. 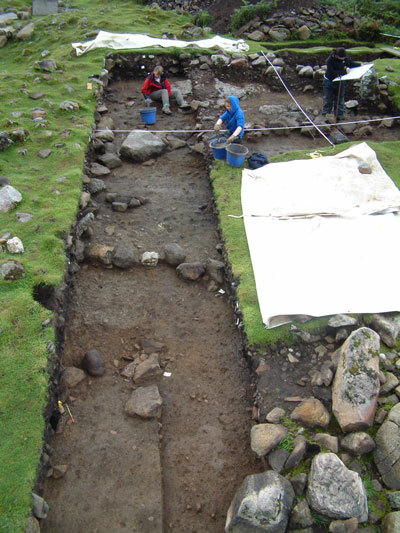 Trench 20 was opened to further investigate the stone-built cellular structure uncovered in the eastern sector of Trench 19, and to evaluate a possible entrance into the High Pastures site. Located between a natural volcanic dyke and a monumental stone-built wall that runs in a easterly direction from the entrance, the possible ‘hollow-way’ had also been highlighted by the geophysical survey that was carried out during the 2006 fieldwork season by David Hodgson and Susan Moore. 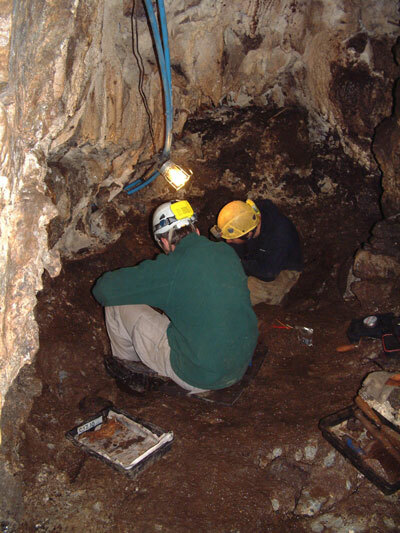 The image above shows Yoran Kremer and Michiel Peterson excavating in Trench 20, with the possible entrance at the right of the image and the cellular structure to the left. The excavations failed to find any continuation of the cellular structure, although tailings from the burnt mound deposits were uncovered, thinning over the natural volcanic dyke bedrock. However, during the excavations, a possible cut was detected in the dyke bedrock on the northwest side of the trench. This had been suggested by the geophysics survey of 2006, indicating a possible cut in the dyke - potentially relating to a track or entrance, or a natural stream course. 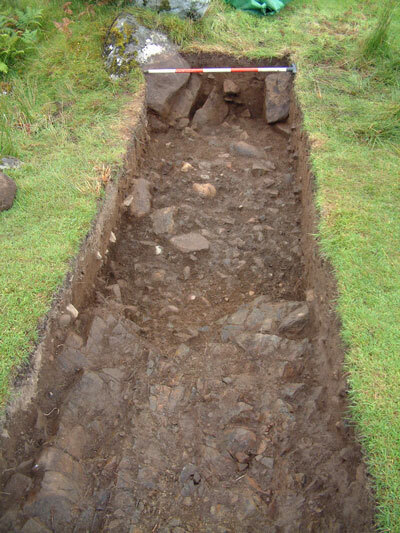 With further excavation of the burnt mound deposits in the cut, it became apparent that this was some form of feature - comprising a steep-sided cut to each side in the volcanic dyke bedrock and filled with compacted burnt mound deposits, which became more organic with depth. The image above shows the cut in the volcanic dyke rock and fill of burnt mound deposits (scales = 1m & 0.5m). Before the organic-rich burnt mound deposit had been encountered, no finds had been recovered from this trench. However, the deposit has already produced iron slag, a fragment of iron pin and a fine bronze ring (see the Latest Finds Page for details of the bronze ring). 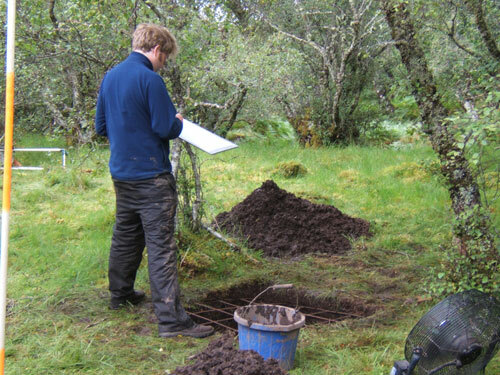 Further excavations are planned in this area to see what type of feature we have encountered here. Absolutely great site! Nice pictures Steven by the way, I’ll just download a couple for my report.